Many things regarding to music happened during last week. First, I bought my first CD online. I bought a lot of things online before, but for some reason, I never bought any CD online, strange. 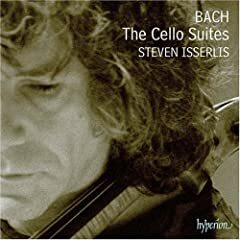 The CD I bought was "Bach: The Cello Suites" by Steven Isserlis - the winner of last year's Gramophone award of the instrumental category. The second thing was, on Friday, my brother and I went to Lincoln Center for Dvořák's Symphony No.9 "From the New World" preformed by the NY Philharmonic. This was the first time I went to Avery Fisher Hall and it was huge, 2738 seats! Great acoustics as well. We sat at the back but the volume and the tone quality have not weaken a bit. The floor will even "shake" when the timpani was played. I've also ordered tickets to another concert, Anna-Sophia Mutter playing Mendelssohn's violin concerto with the NY Philharmonic, for next February. Highly antisipating that.